Mix the ingredients in a bowl and keep on tasting it and add sugar and lemon as you like it. Place a piece of baking paper on a plate. When the cream is ready, take out small portions by hand, or with a teaspoon and form little rolls about 0.5x3 inches and place them about 0.5 inches from each other on the plate. When you're ready, melt the dark chocolate and pour it on top of each roll and cover them fully, or if you prefer cover only parts of the rolls and make stripes or other patterns on them. Put the desserts in the fridge and serve when the chocolate fully settles. 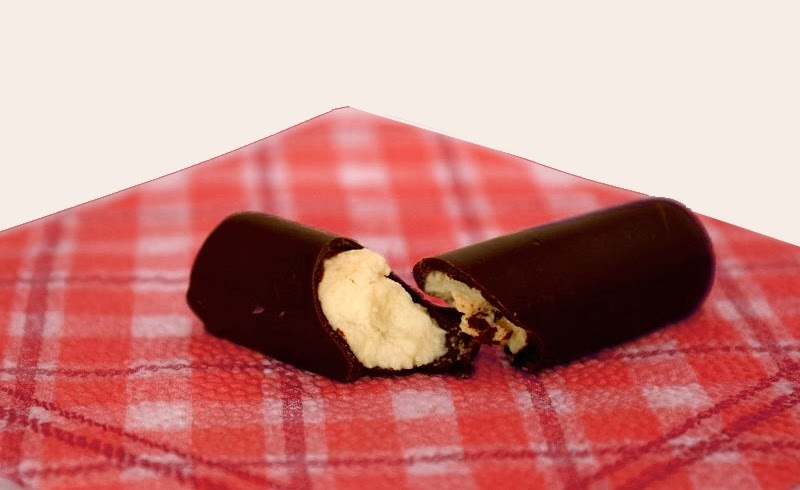 Note: If you want to fully cover the rolls with chocolate (even on the bottom), melt an additional 30-50g chocolate and pour it on the baking paper as chocolate stripes and after this you can form the cottage cheese rolls on top of the chocolate stripes. Looks yummy! I would love to try this. Thanks!